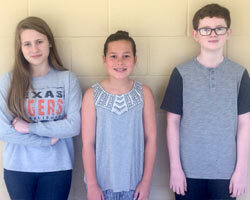 Texarkana, TX – Texas Middle School student scientists were selected as category winners in the Region VIII Education Service Center Science Fair and East Texas Regional Science Fair. 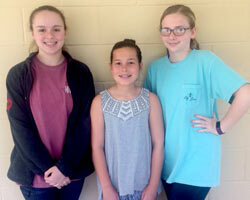 Winners in the Region VIII Education Service Center Science Fair held on February 2 in Pittsburg, Texas were: Jenna Woodard, First Place for 8th Grade Physical Science category; Madelyn Bixler, First Place for 6th Grade Biological Science category; and, Lauren Roberson, Second Place for 6th Grade Biological Science category. Macy Sloan, Third Place in Biological Science category and a cash prize ($100) from the American Chemical Society.